Yoink v2.0.1 for iPad and iPhone brings many bug fixes and improvements, increasing the overall stability and performance of the app. It is a free update for existing customers. Yoink is your storage space (or “shelf”, as some would call it) for everything you’d like to keep around for a little while – text snippets, images, files – just about anything you wish. 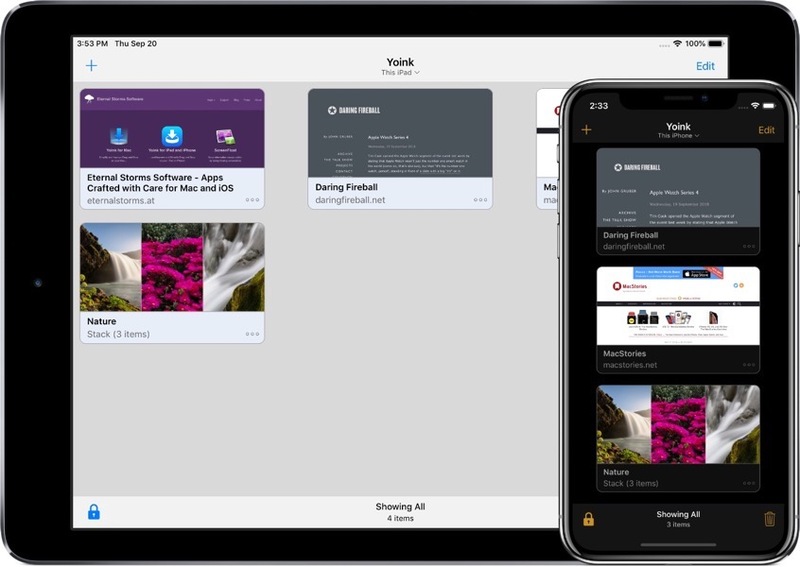 Use drag and drop with Yoink as a Slide-Over or Side-by-Side app to store files, or use the Action/Share extension, the Today Widget or the File Provider to get files into Yoink. The most obvious use case is to drag and drop files to it from other apps, like selected text, or images from websites, or emails, or map locations, just to name a few. So, now that you’ve got all your files in Yoink, how can you get them out again? – You can drag and drop anything from Yoink to any other app that supports drag and drop (and the dragged file types). – Anything in Yoink can be copied to your clipboard. – Yoink’s keyboard: Wherever you’re editing text, Yoink is right there with you – in the form of a keyboard. On iPad, drag and drop items out to where you’d like them in your text; on iPhone tap to copy items. What’s New in Yoink v2.0.1? Being a maintenance update, there are no flashy new features. Instead, the update focuses on stability, reliability and performance. Apart from fixing a couple of crashes, improving the reliability of iCloud sync and saving items in Yoink in general and many minor improvements and bug fixes, the update now (finally! – I know) fully supports the new iPads’ screen sizes, makes it easier to access Yoink’s settings and switch to Dark/Light mode, and, when sharing a URL to Yoink, it tries to figure out for you if you’d like to download a file, or just save the link in Yoink. You can find the full list of changes on Yoink’s App Store page. Yoink for iPad and iPhone is available on the App Store for the price of $5.99 / £5.99 / €6,99, with all features unlocked – there’s no subscription or in-app purchase. Yoink requires an iPad or iPhone that runs iOS 11 or newer. It’s available in English, German, Japanese, Simplified Chinese and Korean. More languages will follow. Yoink is also available for (and originated on) Mac, exclusively available on the Mac App Store for the price of $6.99 / £6.99 / €7,99, with a free, 15-day trial available on its website. This entry was posted in App Store, Public Relations, Software and tagged app store, drag, drop, ios, ios app store, ipad, iphone, update, yoink by Matthias Gansrigler. Bookmark the permalink.